Leading by 11 points with 8:14 left in the game, the No. 7-seed Florida Gators (26-11) collapsed and were outscored 18-3 down the stretch, falling 72-68 to the No. 4-seed Louisville Cardinals (30-9) in the Elite Eight round in the West Region of the 2012 NCAA Tournament at the US Airways Center in Phoenix, AZ. It was the second-straight year that Florida choked away an opportunity to advance to the Final Four by blowing a double-digit lead they carried more than midway through the second half. The Gators scored just three points while hitting just 1-of-12 shots over the final 8:14. UF also went 1-for-4 down from the free throw line down the stretch and went 0-for-9 from three-point range over the final 20 minutes. [EXPAND Click to expand and read the full Florida-Louisville game story. ]Florida opened up the contest on a quick 7-0 run but Louisville one-upped them, answering with a 10-0 run of their own by forcing three turnovers and hitting a pair of treys. However, a three from the corner by UF junior forward Erik Murphy evened the score at 10-10 with 13:35 remaining in the first half. The Gators regained some momentum but were unable to pull away as the Cardinals forced a shot clock violation (UF’s fifth turnover in the first 12 minutes of the game) and tied it up at 19-19 on a jumper by guard Peyton Silva, Jr. Florida then erupted on a barrage of baskets and threes, outscoring Louisville 20-10 while making five triples to take a 39-29 lead with 1:58 left until the break. UF held on to most of that advantage down the stretch, going into the locker rooms with an eight-point lead while shooting 66.7 percent from the field and 72.7 percent (8-of-11) from downtown. UL kept it close by not only forcing five turnovers but also attempting 11 more shots in the first 20 minutes. The Cardinals took it to the Gators early in the second half, using a 7-0 run to cut their deficit to three. Florida and Louisville jockeyed for position until UF found themselves back ahead eight with 12:31 left after sophomore center Patric Young threw down a monstrous slam on an alley-oop from senior point guard Erving Walker. The Gators continued scoring and went up a game-high 11 points on the Cardinals, 58-47 with 10:56 remaining, concluding an 8-2 run with four consecutive free throws by Walker which came following a foul by Siva and technical on Pitino. Louisville refused to relent and got right back in the game moments later, exploding on a 12-1 run to tie it at 66 with 3:10 left. The Gators went ice cold, missing four baskets and three-of-four free throws to allow the Cardinals to wipe out their advantage. Florida junior G Kenny Boynton knocked in a jumper to put the Gators back up two with 2:43 left, but UF missed their final seven shots (three treys) and gave UL multiple opportunities to gain and extend their lead. Down one with 25 seconds left, Beal intercepted a pass but immediately travelled, committing Florida’s 14th turnover of the game and allowing Louisville to take a three-point lead on two free throws. Beal and Boynton each missed a three on the team’s second-to-last possession, and the Cardinals knocked in another free throw to ice the game and their ninth Final Four berth. The Gators fell to 21-2 this season when leading at the half and failed to be the first No. 7-seed to reach the Final Four since the tournament expanded to 64 teams in 1985. 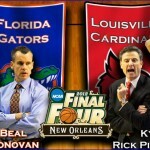 Florida head coach Billy Donovan also remained winless (0-7) in his career against Louisville head coach Rick Pitino with the loss. Turnovers were the primary difference in the game. The Cardinals forced 14 and scored 15 points off those miscues while only committing six of their own (the Gators did not capitalize on any of them). Florida outshot Louisville from the field (.500-.450) and downtown (.400-.375), but UL took 12 more attempts from the field and were more accurate from the charity stripe (.800-.667). The Gators also won the rebounding battle 32-27; however, the Cardinals got 22 points from their bench while UF’s only contributed five. Florida dropped an Elite Eight contest to Butler in similar fashion one year ago, leading by 11 points with 9:26 remaining but allowing their opponent to tie the contest with less than four minutes remaining. Butler wound up winning 74-71 in overtime. G Russ Smith led the way for Louisville with a game-high 19 points, and F Chane Behanan joined him at the top of the box score with 17 points on 7-of-10 shooting. The Gators got 14 points each from Beal (6-of-12) and Murphy (4-of-5, 2-for-2 from three), who combined to grab 15 rebounds. All five Florida started scored in double figures with Boynton and Walker each posting 12 and Young contributing 11 (on 5-of-7 shooting) along with six boards. UF now heads home earlier than they hoped for the second-straight season and awaits word from three of their players about their future. Beal, Young and Boyton will all consider turning pro and declaring for the 2012 NBA Draft though Young has already said he plans to return for his junior season and Boynton is not expected to depart. Tough, tough loss to stomach but I have to say that when this tournament started, I would’ve been shocked had they made it out of the first weekend. You could tell that Kenny and Bradley’s legs were tired when they front-rimmed their last two three point shots–both were good looks. Billy’s got the program back where it should be. Two consecutive Elite Eight appearances is nothing to sniff at–particularly this year with so little frontcourt depth. This loss hurts for sure, but there is a bright side. Gator hoops is in a good place for sure. Title of the article says it all. It’s baseball season! At least our ladies rocked today.. Some observations…once again Walker takes ridiculous shots that put us in bad transitional situations. Thanks for the memories Irving…memories of nothing but bad decisions. Next, I sure hope Beal doesn’t choose to finish his Gator career like that. We should have gotten the ball down to Young more often. Two years of choking is hard to stomach. Hey thanks for the quality observations bud. If you’re going to slam a kid, at least spell his name right. ERVING Walker did not lose this game for the Gators. Louisville was more poised all around, switched from a zone to man that totally threw off our offense, and I think every player took some questionable shots down the stretch. Everyone bashes Walker because he’s the easiest scapegoat— he’s small, doesn’t excel at any one thing, and tends to be more involved in late-game situations. He lends himself to criticism, but the guy has won just as many, if not more, games than he’s lost, so lay off. Can’t call yourself a Gator fan if you’re going to bash a dude who gave everything he had for this program and did far more than anyone expected of him when he came here. No, everyone lashes out at Walker because he has limited basketball IQ and a big hero complex. He is consistently making bad shooting decisions and many of our losses can be directly pointed to his decisions, including this one. He want to “stick the knife in the gut of the opponent” or “deal the knockout blow” with an incredible 3 point shot to extend the lead quite often, and when he does, the team loses all rhythm and momentum. That is exactly what happened on saturday when took the absurd short with 32 seconds left on the shot clock and UL got their own 3 in transition – a huge 6 point swing at a critical juncture in the game. He then missed 2 foul shots almost immediately after that, clearly not concentrating on his shot at that point. That turned a comfortable double digit lead into a 3-4 point game and gave UL hope. Exactly the same thing he did against Butler…and about 10 other games I could name that we lost directly due to his poor choices. There are tons of examples of him making horrible shooting decision, leaving the other team in a great transitional situation, and he never learns from it and plays within himself. That is why so many are so angry, we see it over and over and while we love his passion, appreciate his effrort, we are aren’t sorry to see him go. Everyone doesn’t lash out at Walker. We had this game, found a way to lose it at the end. These games are harder to lose than getting drilled I think. It was a nice run though, this team was dead in the water 2 weeks ago so didn’t expect anything, to see them play so well was a bonus.